Photo One: A young rider screams with excitement as he rides down Killington Resort’s newest adventure ride, the Beast Mountain Coaster, which opened Saturday. 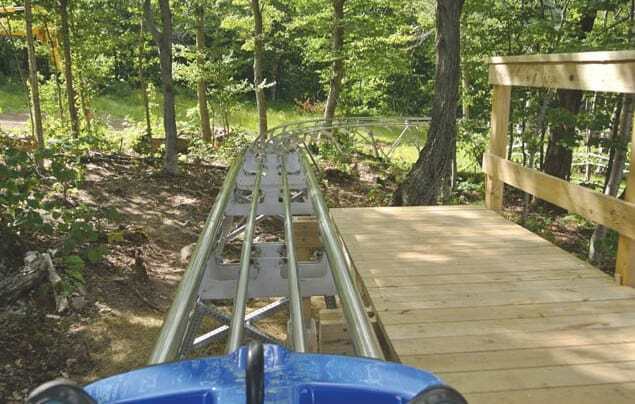 Photo Two: The view looking down the new Mountain Coaster track from the seat of on of the 35 blue “smart” cars. 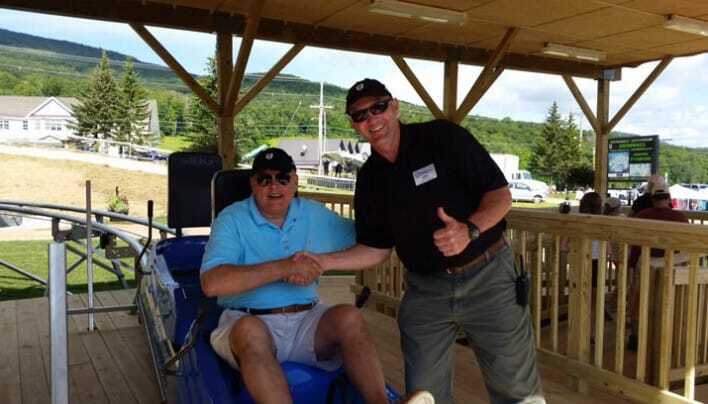 Photo Three: Jeff Temple, Killington’s director of mountain operations, poses with the first paid rider on the new Beast Mountain Coaster Saturday morning, July 25. Riders reported that the coaster was a blast and tons of fun with twists, turns and G- force that make you feel like you’re on an Olympic bobsled course. Killington debuted its new Beast Mountain Coaster to the public on Saturday, July 25, at the new Snowshed Adventure Center. The experience starts with a leisurely uphill ride on one of the 35 bright blue “smart” cars, followed by a rider-controlled descent. Push the handle fully forward and zoom to speeds of 25 to 30 miles per hour, the coaster’s maximum speed. The features along the 4,800’ long steel track make it a dareto go that fast. They include 360-degree corkscrews, banks, dips, and rollers as the coaster twists and turns its way down the mountain. The speed control handle allows riders to control their speed, so one can choose to just meander down the track, taking in the scenery, or participants can release their inner race-car driver and go full speed ahead. Either way, you can coast without a care — no worries about other drivers or flying off the tracks. That’s because the Beast Coaster features a patent-pending collision avoidance system. Automatic speed restrictors, brake lights, and alarms maximize safety while ensuring a fun, exhilarating ride. Seat belts keep riders safely in the cart even during high G-force turns. “It is the only coaster built with these state-of-the-art, proprietary safety features; we invented it,” noted Jessica Mahoney, marketing director for Aquatic Development Group which designed and manufactured the American-made ride. The construction of the custom-designed coaster involved 60-80 local contractors and Killington workers. The ride now contributes to the 35 full-time jobs at the new Snowshed Adventure Center, according to Killington spokesman Michael Joseph. The coaster operates daily 10 a.m. to 5 p.m. and on Saturdays until 6:30 p.m., which dovetails with the Cooler in the Mountains Saturday music series now relocated to the Snowshed Base area. Joseph called the coaster a significant part of the $3.5 million Snowshed Adventure Center, noting it puts the finishing touch on an assortment of rides that allow folks to engage in a variety of activities that lets them be as “extreme” as they wish. “We promised a new level of energy this summer, and it is absolutely here. High-adrenaline rides like the coaster and Skyeride bring the thrills while live music and incredible food chill you out. If you love Killington, you’ll love the Snowshed Adventure Center,” Joseph added. The Snowshed Adventure Center, which opened on June 26, offers the Skyeride, Skye Ropes Course, Segway riding tours, ATV off-roading tours, new and improved mountain biking experiences, the Terra Maze, sluice mining, gondola rides, hiking, disc golf and water sports like fishing, kayaking, and stand-up-paddle boarding on Snowshed Pond. The new Snowshed Patio offers al fresco dining and beverages and the indoor food fourt is open as well. Vermont and New Hampshire residents save 50 percent off Adventure Center day passes, mountain bike lift-and-trail tickets and learn-to-ride packages, scenic lift rides, and Segway tours this summer. Check out killington.com for other discounts for passholders and Chamber members. Also new this year, Killington is offering five Saturday night dining experience atop Killington Peak (Aug. 8, 15, 22, Sept. 5, and Oct. 10.) This top-of-Vermont offering features amazing views and a romantic sunset to go along with a dining experience that starts with a farm-fresh salad bar and ends with signature sweets at the dessert station. In between, diners can enjoy a variety of selections from chef-served pasta, carvery, and grill stations. Wine, cocktails and drafts are options at the Peak Bar and local artists will provide live music from 6-8:30 p.m. The Peak Lodge sunset dinner is $39 per person, plus tax and service fee and includes a round-trip ride on the K-1 Gondola, which operates from 5:45 p.m. to 9 p.m. Reservations are advised as seating is limited.